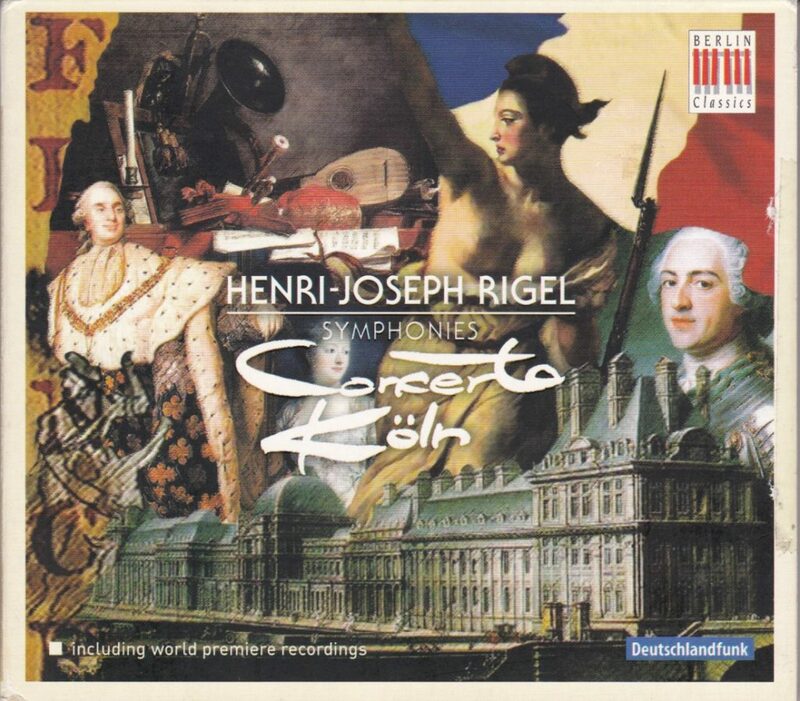 Henri-Joseph Rigel was born in Wertheim, Germany in 1741 and studied music with Niccolo Jomelli in Stuttgart and Franz-Xaver Richter in Mannheim (one of the founders of the so-called Mannheim School – link will open new tab to my Richter introductory page), but he moved to Paris in 1767 and met fame there, until his death in 1799. As many others, a celebrated composer under the “Ancient Regime”, he adapted to the new times by writing revolutionary hymns and became, with Mehul, Gossec and Cherubini, one of the founders of the Paris Conservatoire in 1795. The five symphonies played by Concerto Köln are fine specimens of the late-18th Century genre, true to French fashion in that they are all couched in the three-movement architecture derived from the Italian Overture, without the typical Viennese Menuetto, and they are a welcome addition to the roster of works and composers from the same era (second half of the 18th Century) similarly served by Concerto Köln, among them Salieri, Gossec, Vanhal, Rosetti, Dussek, Kraus, Cannabich, Stamitz, Kozeluch, Myslivecek, Wilms. That said, I’m maybe not as enthusiastic as the author of the liner notes, Benoît Dratwicki from Centre de Musique Baroque de Versailles, the research and production center of French 17th and 18th Century music hosted at Château de Versailles that published a critical edition of the scores (how much do you have to PAY to work there!?). Dratwicki writes that “Rigel’s talent is above all evident in his melodic and rhytmic inventiveness and his skill in writing development sections, which in numerous works possess an impetus and a profundity that is rare in a genre which frequently abounds in playful jests and immediate effects aimed at thrilling audiences. His thematic material, for example, was very orignal. Far from the extremely regular musical clichés of Gossec, Saint-Georges and Leduc, Rigel frequently thought out themes of astonishing character distinguished by disconnected ‘gestures’, as in the first movement of the symphony no. 8 and the outer movements of the Symphony no. 4. Rigel very deliberately adopted a number of typical elements of the German ‘Sturm und Drang’, minor keys, unisson passages for the whole orchestra and chromatic writing, and dramatic silence (last movement of the Symphony no. 7)“. First of all, one doesn’t need to disparage one composer to laud the other one, and Dratwicki is being unfairly unkind to Gossec, who didn’t write “extremely regular musical clichés”, but music of unfettered and invigorating joy (see for instance my reviews of Gossec: Symphonies,Gossec: Symphonies, Op.8 or Gossec: Symphonies, Oeuvre XII). Second, sure there are moments of originality in Rigel’s works, like the lovely slow movement in pizzicati of Symphony no. 14 (track 11) or some dynamic swells somewhere around 4-minutes into the first movement of Symphony No. 8 (track 7). On the other hand Rigel’s middle (rather than “slow”) movements except of Symphony No. 14 ARE very clichéd, written in typical “galant” style and, as elegant as they are, plumbing no emotional depths. Sure, in some of the most dramatic symphonies you can hear the Sturm und Drang influence (as in the outer movements of Symphony no. 4, 8 and 10), and you have movements of great boisterousness and with a sense of invigorating Haydnesque merriment (also found in the symphonies of Gossec) that can be heard at its most unalloyed in the outer movements of 7 and 14. But the main originality of Rigel I find is that the dramatic mood is often combined with that Haydnesque boisterousness. 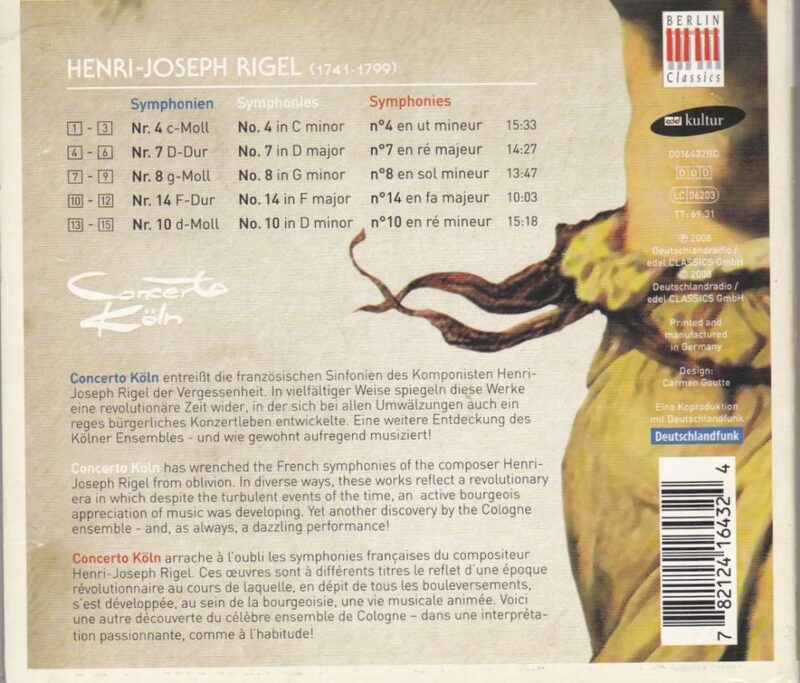 Rigel was no neglected Mozart, but he is a welcome and pleasurable rediscovery.